Refrigerator Berry Pie - Chocolate Chocolate and More! Refrigerator Berry Pie goes together in minutes. You can use your favorite berries in this cool summertime treat! Everyone has a pie recipe they remember their mom making when they were a child that still makes your mouth water when you are grown. In my case, my mom made a strawberry pie which combined dozens of fresh strawberries and a delicious sweet glaze in a flaky crust. Growing up, I didn’t get this pie at any of my friends’ houses when I visited, so I assumed my mom was the only one who knew how to make it. As such, I figured it had to be a complicated pie to make because we only got it once in a while (I mean, if it was easy, wouldn’t mom make it all the time???) Good news is, I now know I was very wrong about that. This refrigerator berry pie is actually a very easy pie to make, and it is also very adjustable to meet all of your favorite berry needs. There is no need to purchase the pre-made “strawberry pie topping” or filling that you can find at your grocery store. If you have 20 minutes, you can whip this up, throw it in the fridge to cool, and have it ready to treat your family after a nice Al Fresco dinner, or wow your friends at your next group picnic. The refrigerator berry pie recipe is the same one that my mom used 40+ years ago to impress us kids — all I have done is add some blueberries to make it a little more festive as we approach the 4th of July holiday. It also allows me to take advantage of my favorite berries. 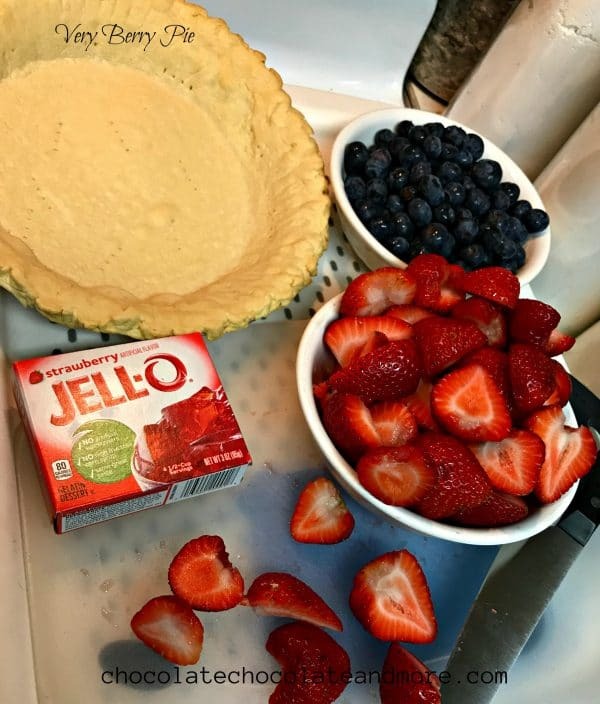 Because you can use any flavor Jell-O you might find in the store for the glaze, you can use pretty much any kind of berry that suits your tastes. Just don’t let your kids know how easy this is to make, or they will be asking for it every weekend! A quick and easy berry filled treat for your next family gathering or summer picnic! Rinse and dry berries. Slice strawberries in half (or quarters if larger berries), and remove stems from blueberries. Set aside. Prepare one deep dish pie crust per directions on box or package. (MUST be deep dish because you need the additional depth to contain the berries and glaze). After removing crust from oven, set aside and allow to cool. As crust bakes, prepare glaze. Combine sugar and cornstarch in a bowl ensuring no clumps of cornstarch remain in the mixture. In 2-quart saucepan over medium-high heat, combine sugar-cornstarch blend and water; heat to rolling boil. Cook a full 2 minutes, stirring regularly to ensure no clumping. Remove from heat and whisk in gelatin. Set aside and allow to cool 15 to 20 minutes. 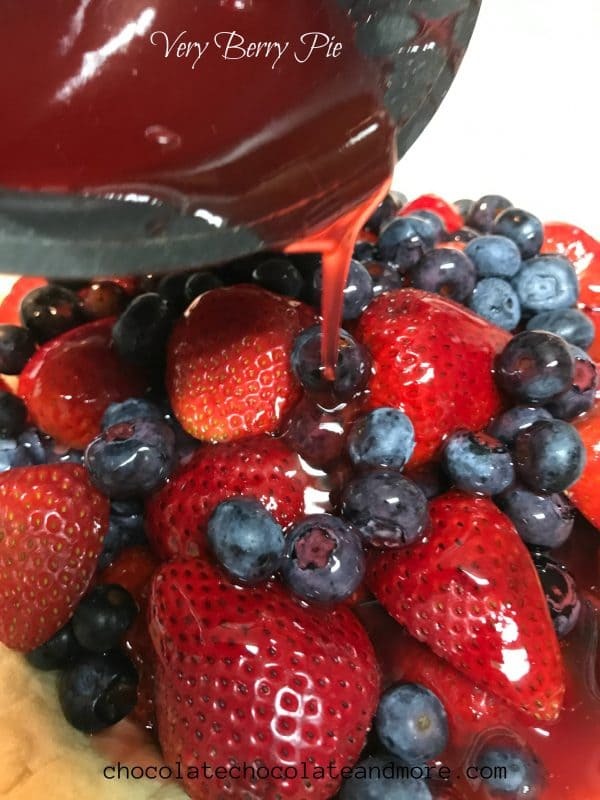 While glaze cools, layer berries in pie crust, starting with strawberries and alternating with blueberries until crust is full. 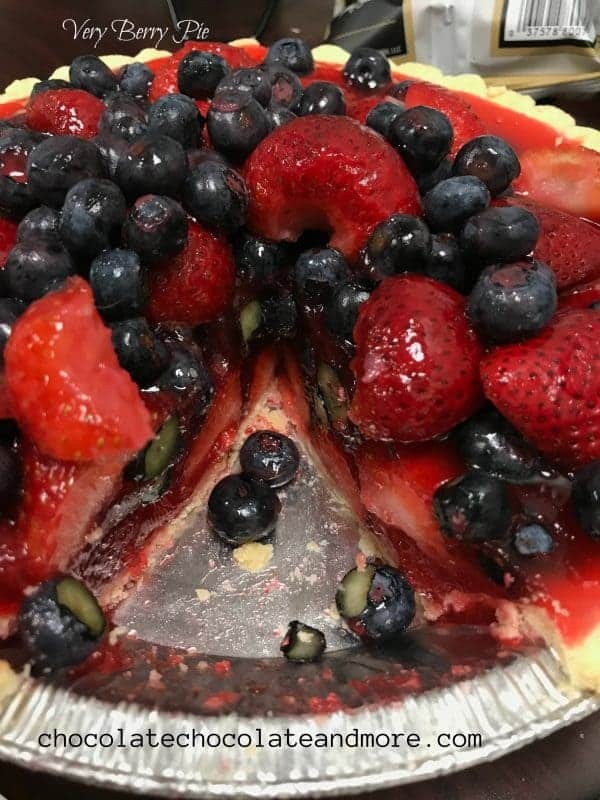 Pour glaze over berries in crust, making sure each piece is covered. Don't allow the glaze to overflow out of the crust. Slice and serve with ice cream, whipped cream, or as is! Love this recipe. 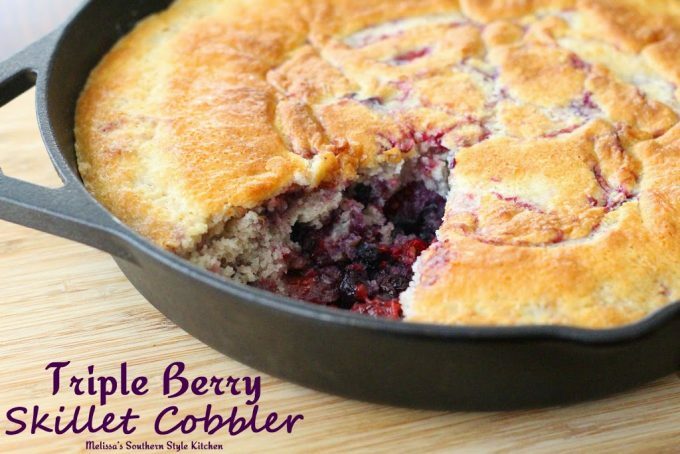 I have been making this with blackberries for over 30 years. The best! That’s the great thing about this recipe! I’m glad to hear you have been using it for so long!